Ha. Po. 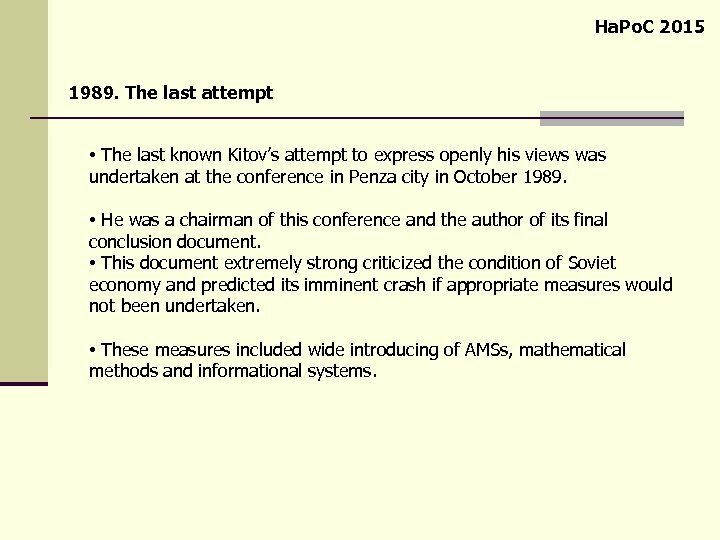 C 2015 The subject of presentation Anatoly Kitov during all his scientific and organizational activity worked in several important fields of informatics: programming, design of new computers, information retrieval systems, algorithmic languages, automated management systems of various levels and appointments, etc. 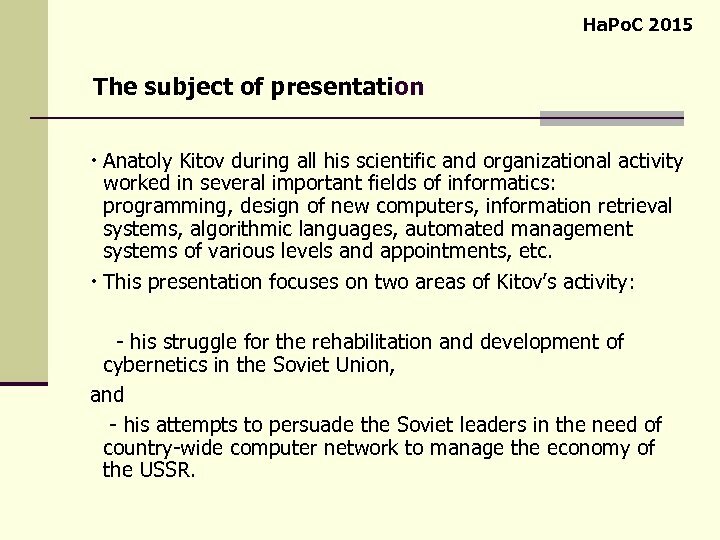 This presentation focuses on two areas of Kitov’s activity: - his struggle for the rehabilitation and development of cybernetics in the Soviet Union, and - his attempts to persuade the Soviet leaders in the need of country-wide computer network to manage the economy of the USSR. Ha. Po. C 2015 1955. Computers are not just the fast calculators. 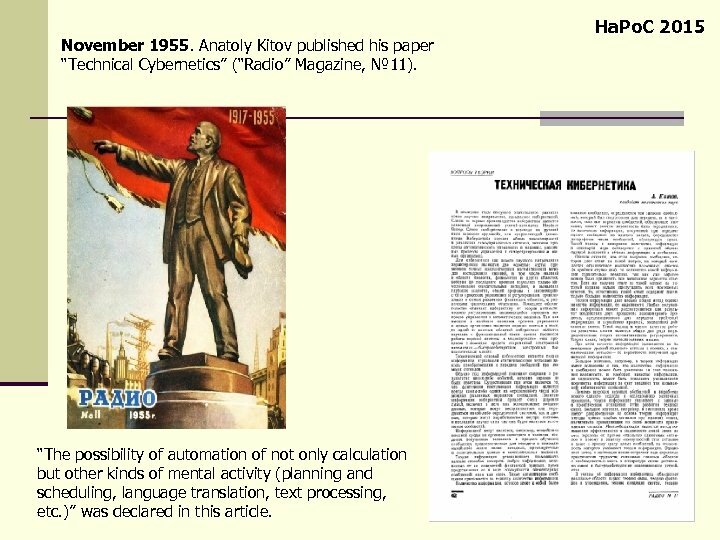 Anatoly Kitov wrote in the article “The main features of cybernetics” (1955, co-authors: Lyapunov and Sobolev, the journal “Problems of Philosophy”) that computers could be used to solve the problems of economics and management. They are not simple fast calculators. Articles “The main features of cybernetics” and “Technical cybernetics” were among the very first positive articles on cybernetics in Soviet country and became a “starting point” of cybernetics in the USSR. 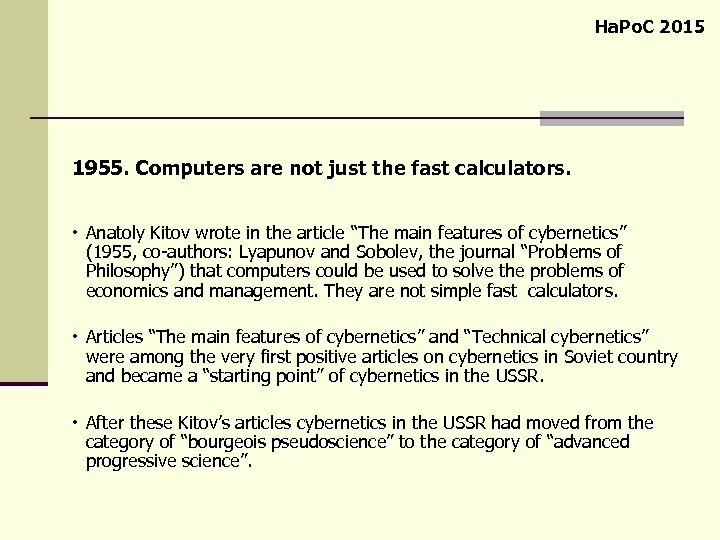 After these Kitov’s articles cybernetics in the USSR had moved from the category of “bourgeois pseudoscience” to the category of “advanced progressive science”. Ha. Po. C 2015 1954 -1960. 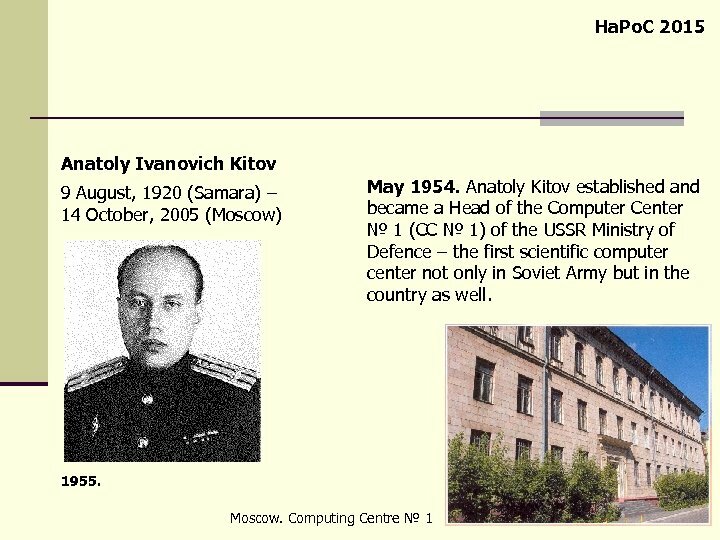 Anatoly Kitov works at the Computer Centre № 1 of the Ministry of Defence as Head and First Head Deputy for Science. 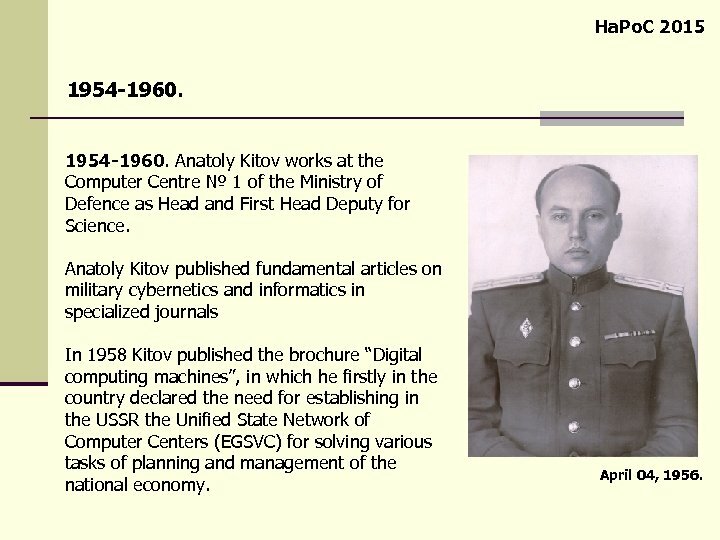 Anatoly Kitov published fundamental articles on military cybernetics and informatics in specialized journals In 1958 Kitov published the brochure “Digital computing machines”, in which he firstly in the country declared the need for establishing in the USSR the Unified State Network of Computer Centers (EGSVC) for solving various tasks of planning and management of the national economy. April 04, 1956. Ha. Po. C 2015 Development and Use of Information Retrieval Systems. In 1950 s all efforts of the Soviet computer scientists were directed on the design of computers. 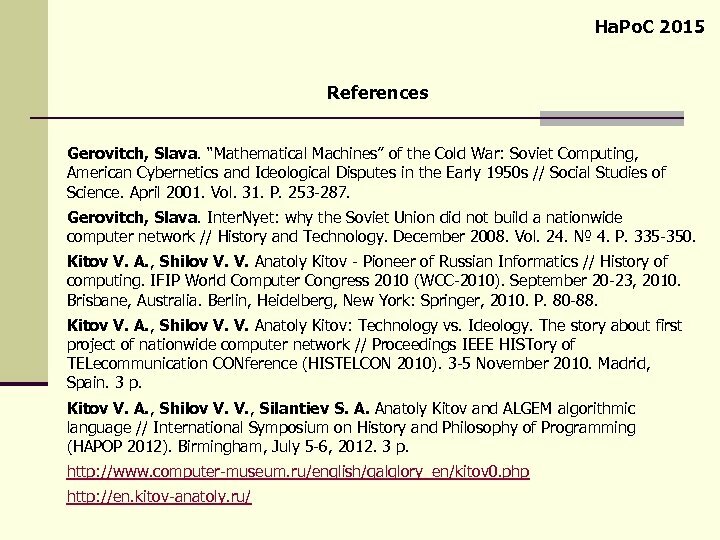 No one in the Soviet Union was seriously engaged in the development of computer data processing systems. 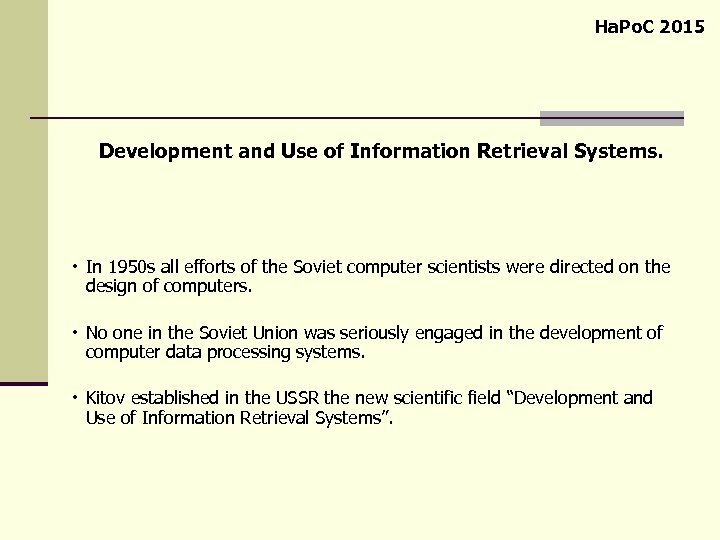 Kitov established in the USSR the new scientific field “Development and Use of Information Retrieval Systems”. Ha. Po. C 2015 January 7, 1959. 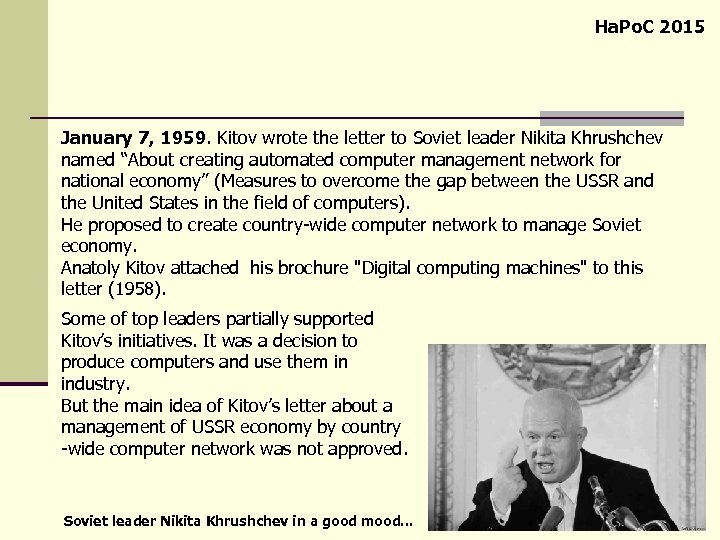 Kitov wrote the letter to Soviet leader Nikita Khrushchev named “About creating automated computer management network for national economy” (Measures to overcome the gap between the USSR and the United States in the field of computers). 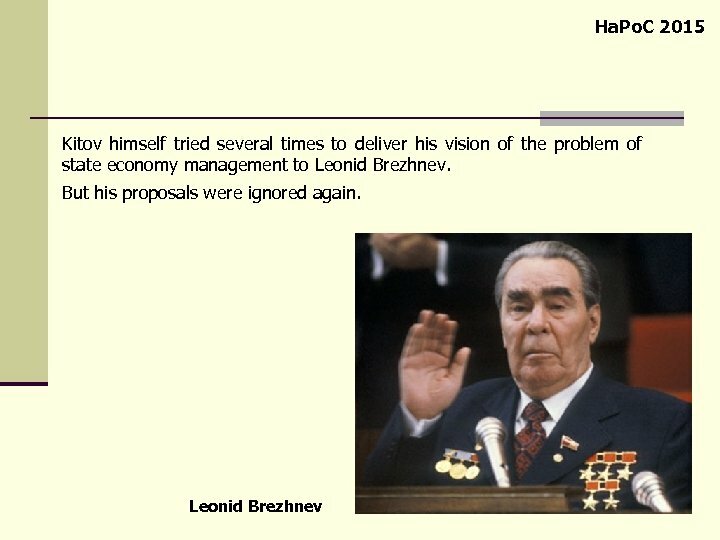 He proposed to create country-wide computer network to manage Soviet economy. 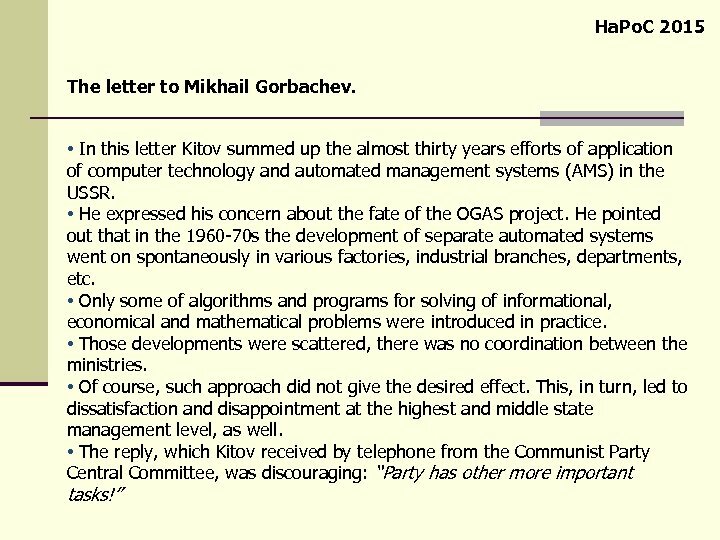 Anatoly Kitov attached his brochure "Digital computing machines" to this letter (1958). Some of top leaders partially supported Kitov’s initiatives. It was a decision to produce computers and use them in industry. 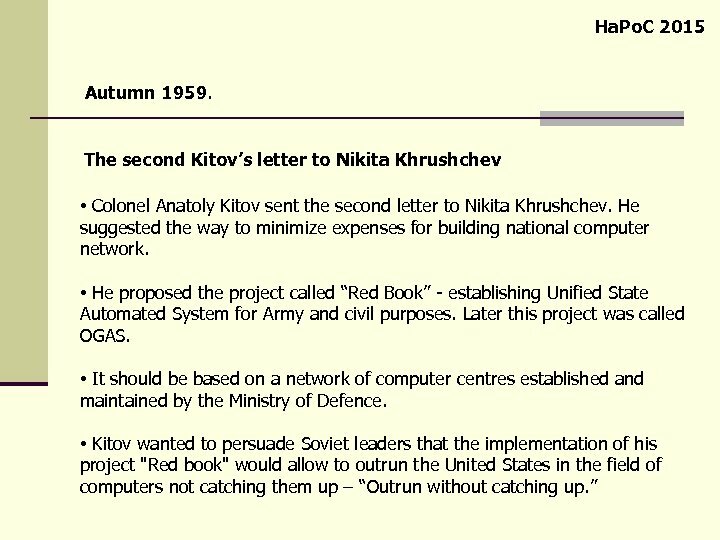 But the main idea of Kitov’s letter about a management of USSR economy by country -wide computer network was not approved. Soviet leader Nikita Khrushchev in a good mood. . .
Ha. Po. C 2015 1959. 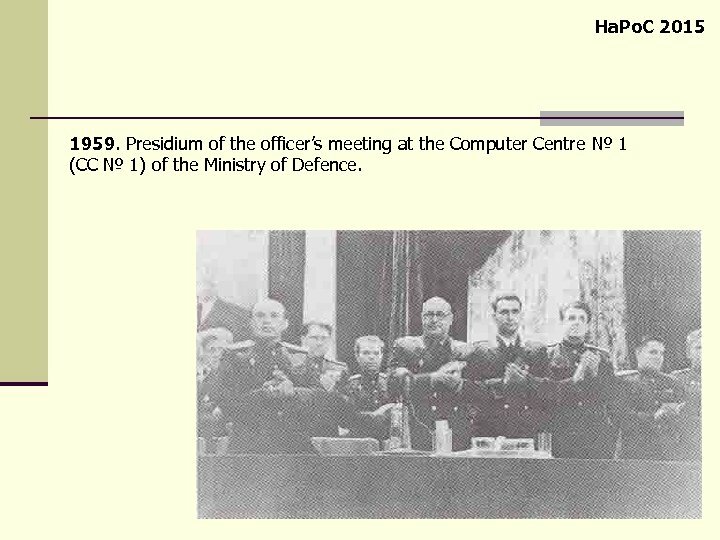 Presidium of the officer’s meeting at the Computer Centre № 1 (CC № 1) of the Ministry of Defence. Ha. Po. 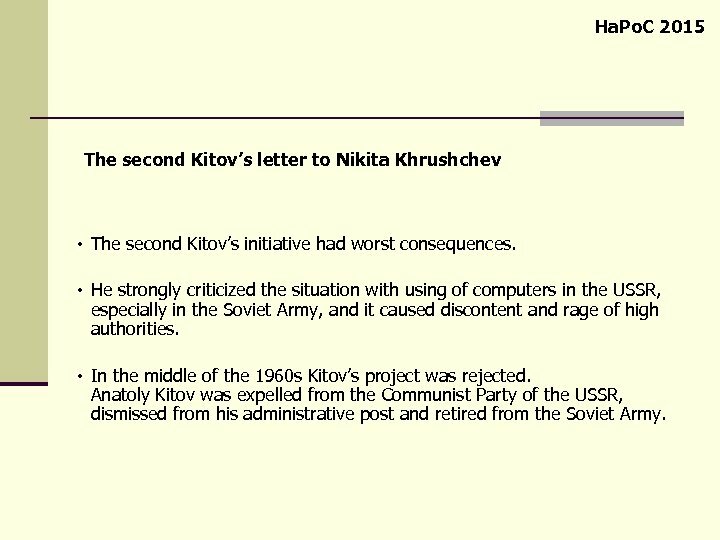 C 2015 The second Kitov’s letter to Nikita Khrushchev The second Kitov’s initiative had worst consequences. He strongly criticized the situation with using of computers in the USSR, especially in the Soviet Army, and it caused discontent and rage of high authorities. In the middle of the 1960 s Kitov’s project was rejected. Anatoly Kitov was expelled from the Communist Party of the USSR, dismissed from his administrative post and retired from the Soviet Army. Ha. Po. 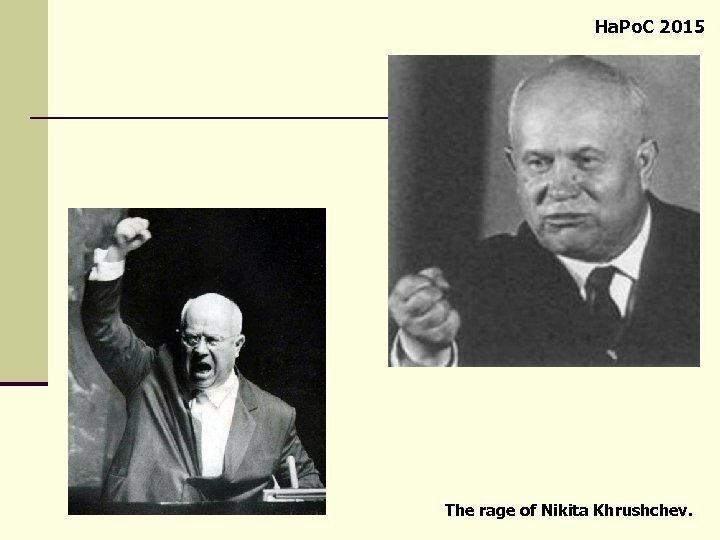 C 2015 The rage of Nikita Khrushchev. Ha. Po. C 2015 November 1959. 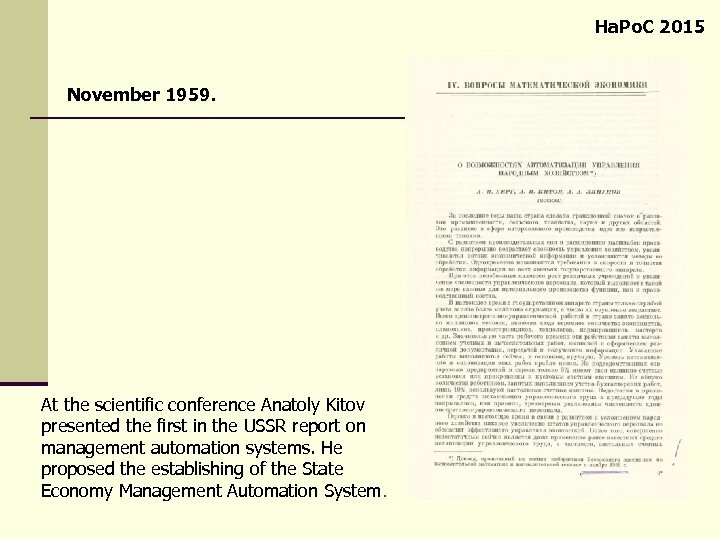 At the scientific conference Anatoly Kitov presented the first in the USSR report on management automation systems. He proposed the establishing of the State Economy Management Automation System. Ha. Po. 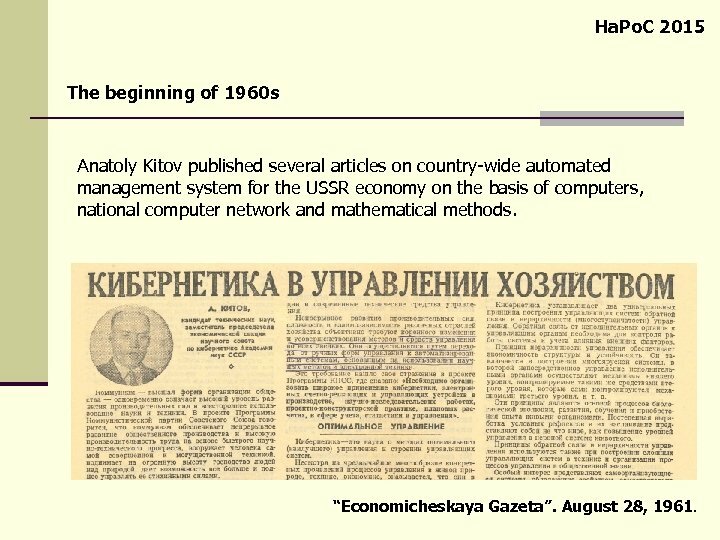 C 2015 The beginning of 1960 s Anatoly Kitov published several articles on country-wide automated management system for the USSR economy on the basis of computers, national computer network and mathematical methods. “Economicheskaya Gazeta”. August 28, 1961. Ha. Po. 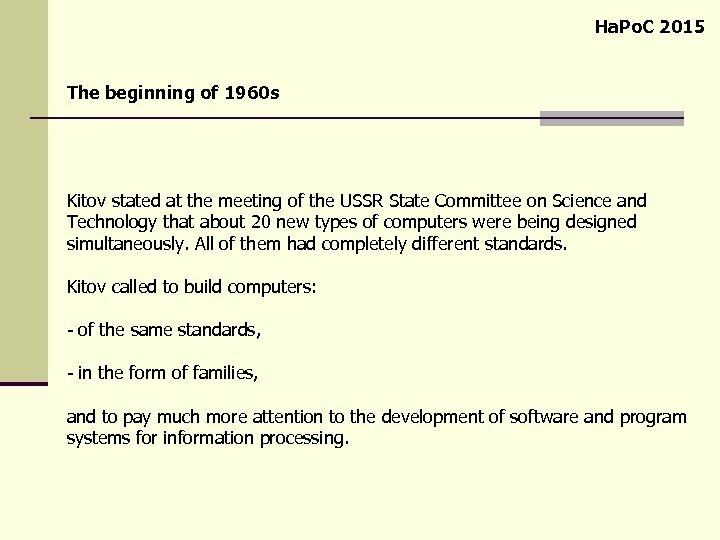 C 2015 The beginning of 1960 s Kitov stated at the meeting of the USSR State Committee on Science and Technology that about 20 new types of computers were being designed simultaneously. All of them had completely different standards. Kitov called to build computers: - of the same standards, - in the form of families, and to pay much more attention to the development of software and program systems for information processing. Ha. Po. 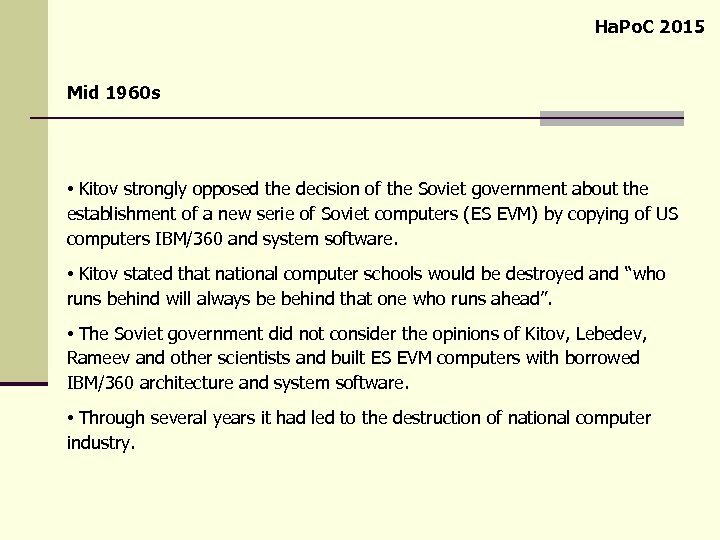 C 2015 Mid 1960 s • Kitov strongly opposed the decision of the Soviet government about the establishment of a new serie of Soviet computers (ES EVM) by copying of US computers IBM/360 and system software. • Kitov stated that national computer schools would be destroyed and “who runs behind will always be behind that one who runs ahead”. 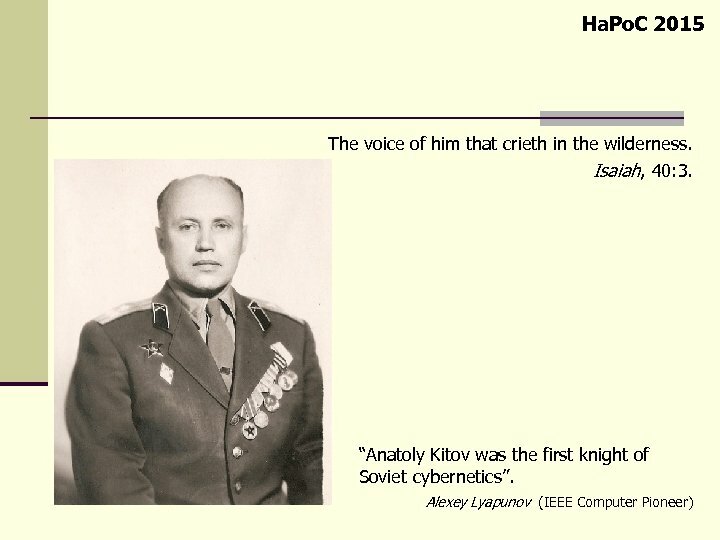 • The Soviet government did not consider the opinions of Kitov, Lebedev, Rameev and other scientists and built ES EVM computers with borrowed IBM/360 architecture and system software. 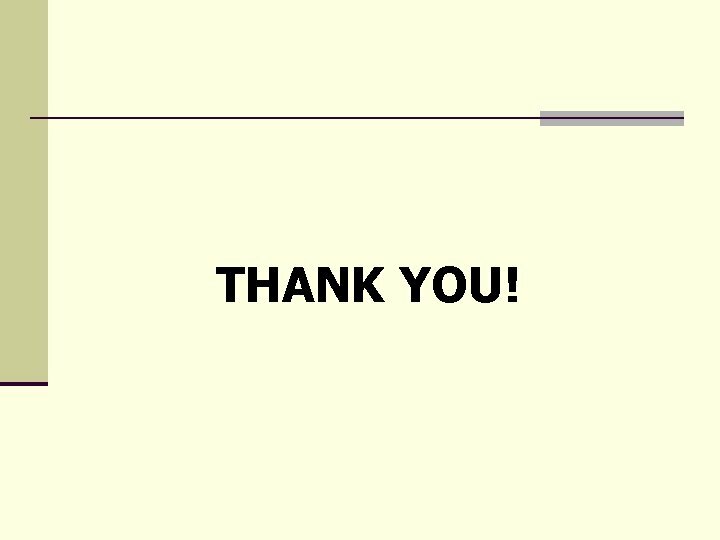 • Through several years it had led to the destruction of national computer industry. Ha. Po. 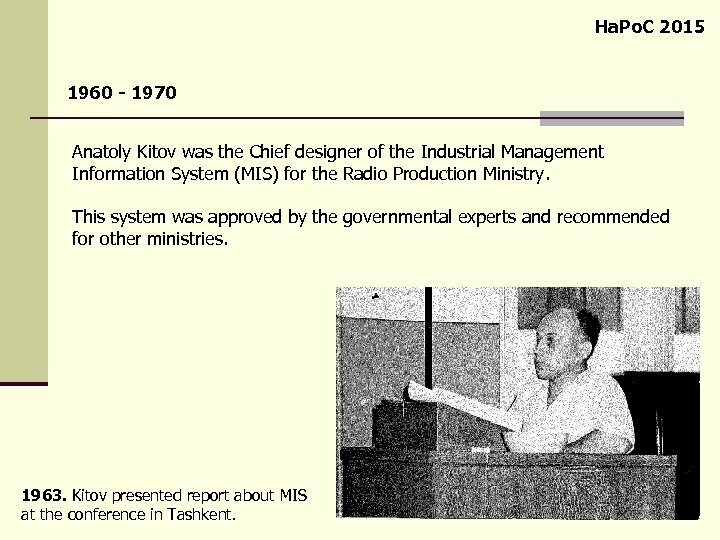 C 2015 1960 - 1970 Anatoly Kitov was the Chief designer of the Industrial Management Information System (MIS) for the Radio Production Ministry. This system was approved by the governmental experts and recommended for other ministries. 1963. Kitov presented report about MIS at the conference in Tashkent. Ha. Po. 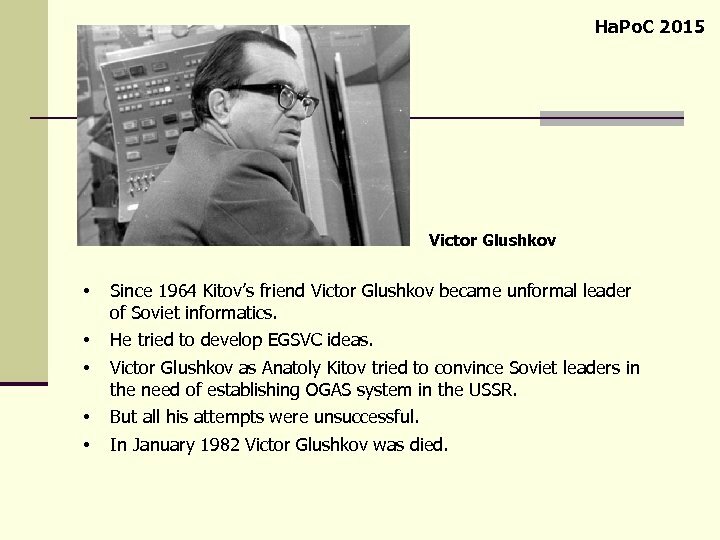 C 2015 Victor Glushkov • Since 1964 Kitov’s friend Victor Glushkov became unformal leader of Soviet informatics. • • He tried to develop EGSVC ideas. • • But all his attempts were unsuccessful. Victor Glushkov as Anatoly Kitov tried to convince Soviet leaders in the need of establishing OGAS system in the USSR. In January 1982 Victor Glushkov was died. Ha. Po. 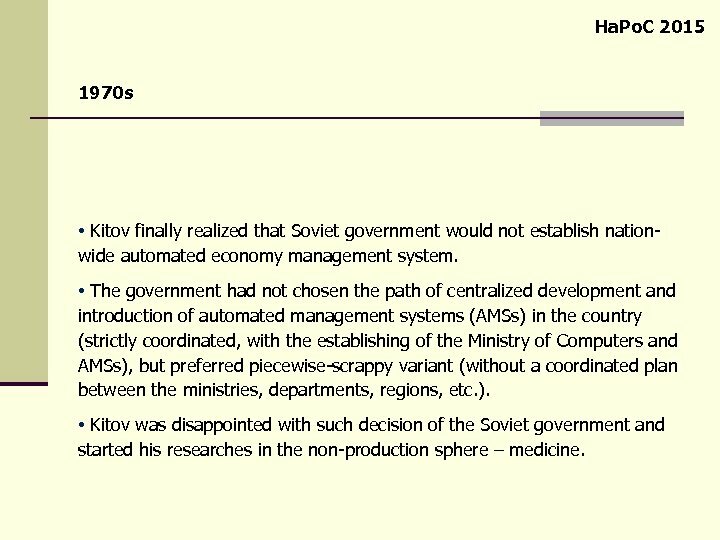 C 2015 1970 s • Kitov finally realized that Soviet government would not establish nationwide automated economy management system. • The government had not chosen the path of centralized development and introduction of automated management systems (AMSs) in the country (strictly coordinated, with the establishing of the Ministry of Computers and AMSs), but preferred piecewise-scrappy variant (without a coordinated plan between the ministries, departments, regions, etc. ). • Kitov was disappointed with such decision of the Soviet government and started his researches in the non-production sphere – medicine. Ha. Po. C 2015 1970 s AMS for the Ministry of Healthcare. 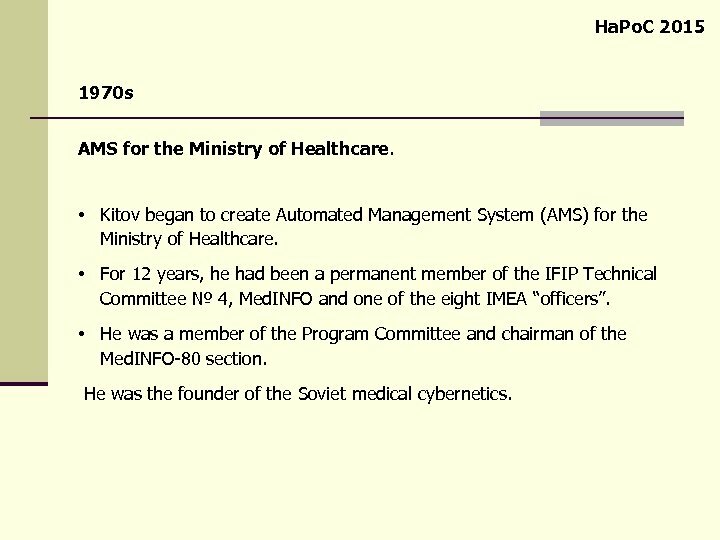 • Kitov began to create Automated Management System (AMS) for the Ministry of Healthcare. 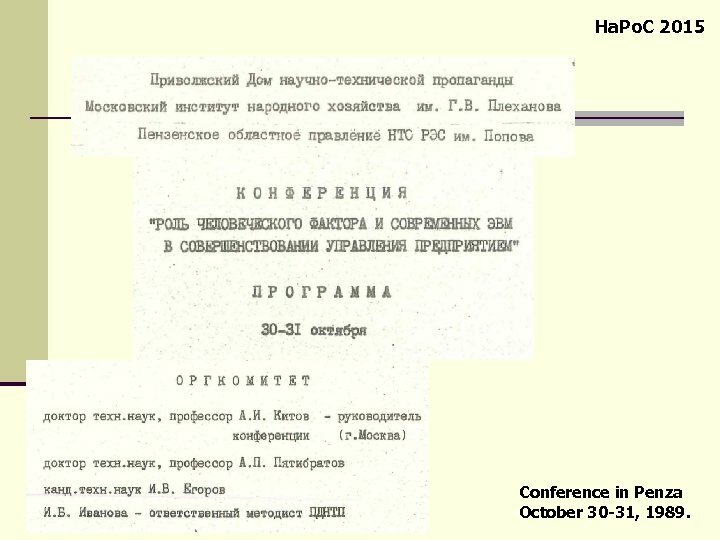 • For 12 years, he had been a permanent member of the IFIP Technical Committee № 4, Med. INFO and one of the eight IMEA “officers”. • He was a member of the Program Committee and chairman of the Med. INFO-80 section. He was the founder of the Soviet medical cybernetics. Ha. Po. 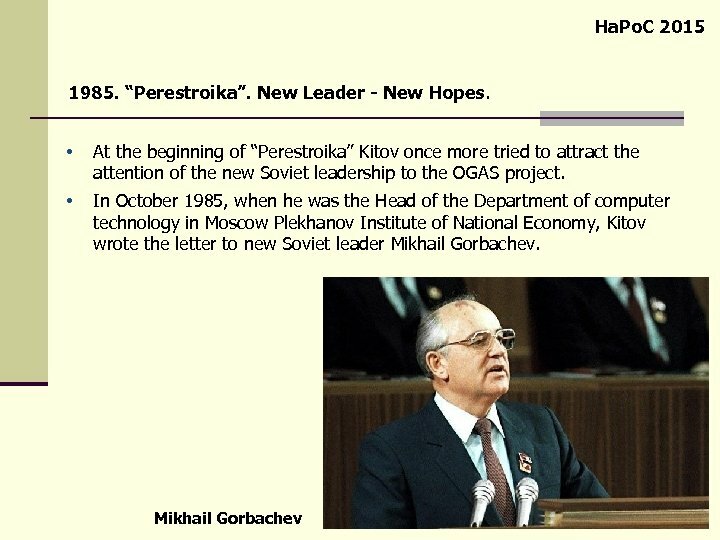 C 2015 1985 • In 1987 he sent the article about a computer network for the national economy management to ideological journal “Communist”. But this paper was also rejected. 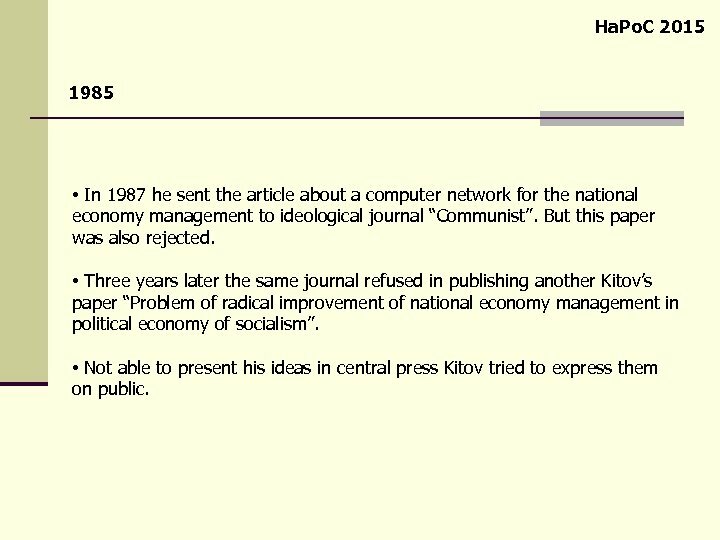 • Three years later the same journal refused in publishing another Kitov’s paper “Problem of radical improvement of national economy management in political economy of socialism”. • Not able to present his ideas in central press Kitov tried to express them on public. Ha. Po. C 2015 1989. 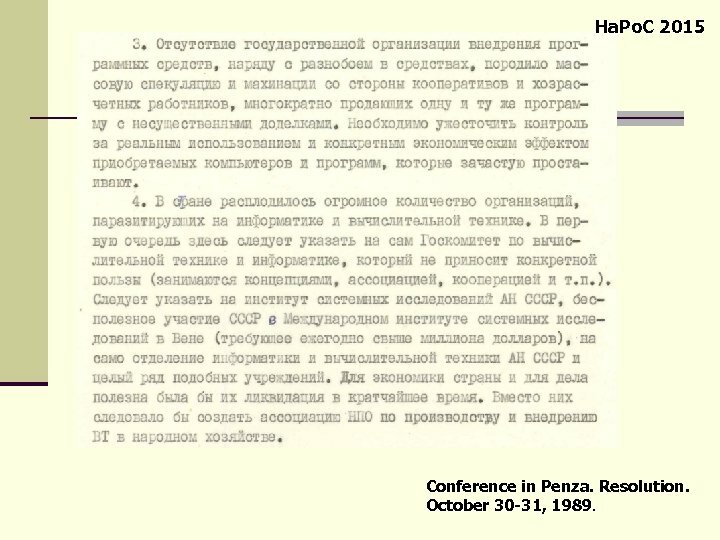 The last attempt • The last known Kitov’s attempt to express openly his views was undertaken at the conference in Penza city in October 1989. • He was a chairman of this conference and the author of its final conclusion document. 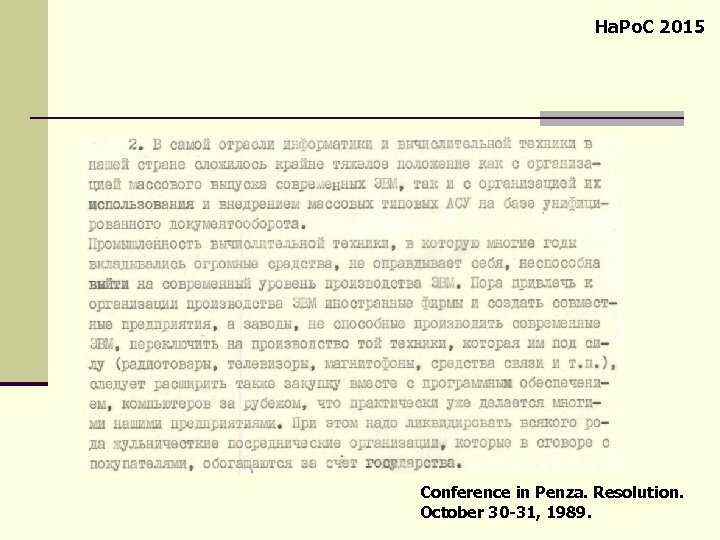 • This document extremely strong criticized the condition of Soviet economy and predicted its imminent crash if appropriate measures would not been undertaken. • These measures included wide introducing of AMSs, mathematical methods and informational systems. Ha. Po. C 2015 Original Documents 1. First letter to Khrushchev (January 07, 1959). 2. 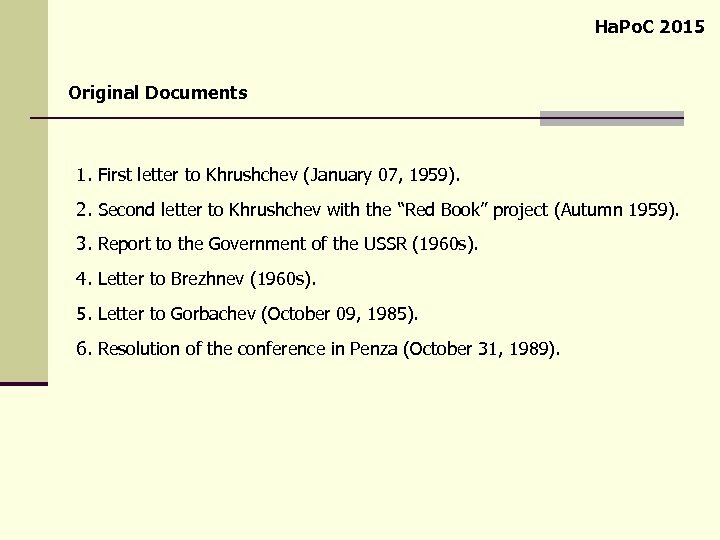 Second letter to Khrushchev with the “Red Book” project (Autumn 1959). 3. Report to the Government of the USSR (1960 s). 4. Letter to Brezhnev (1960 s). 5. 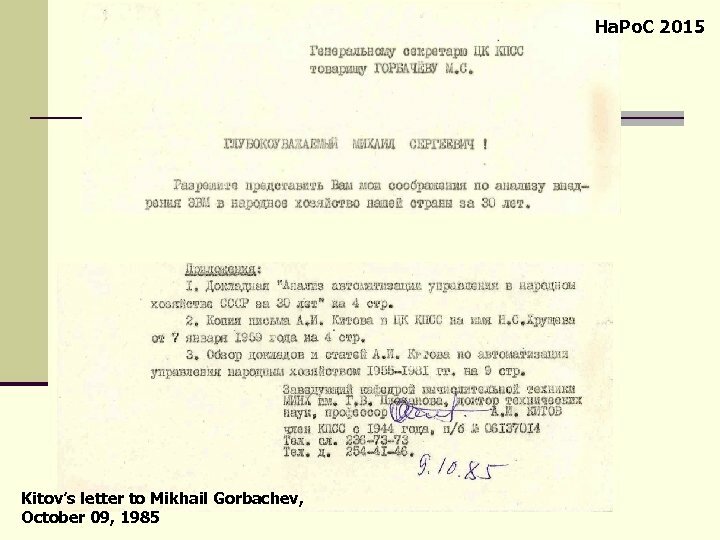 Letter to Gorbachev (October 09, 1985). 6. 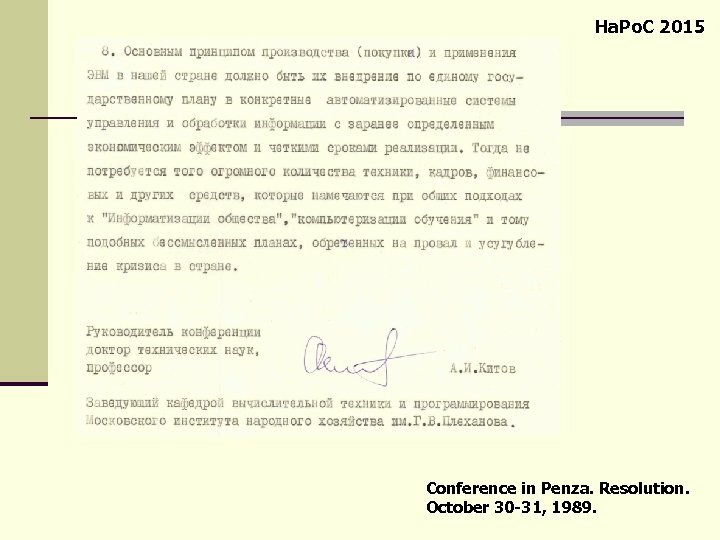 Resolution of the conference in Penza (October 31, 1989). Ha. Po. 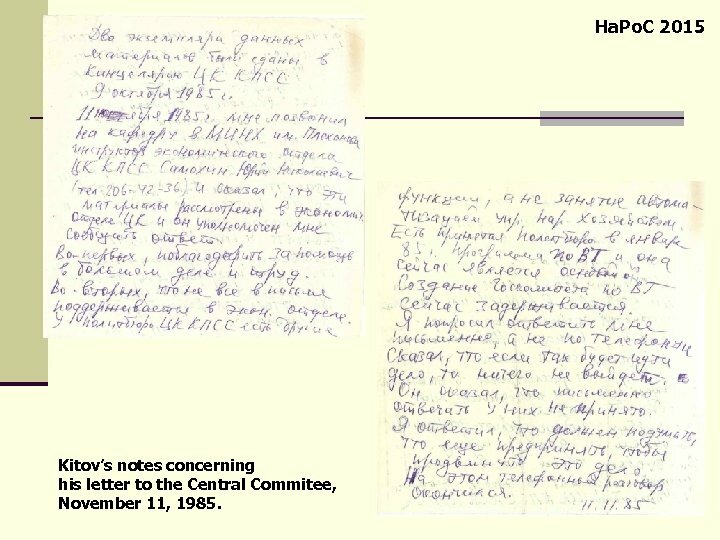 C 2015 Kitov’s notes concerning his letter to the Central Commitee, November 11, 1985. Ha. Po. 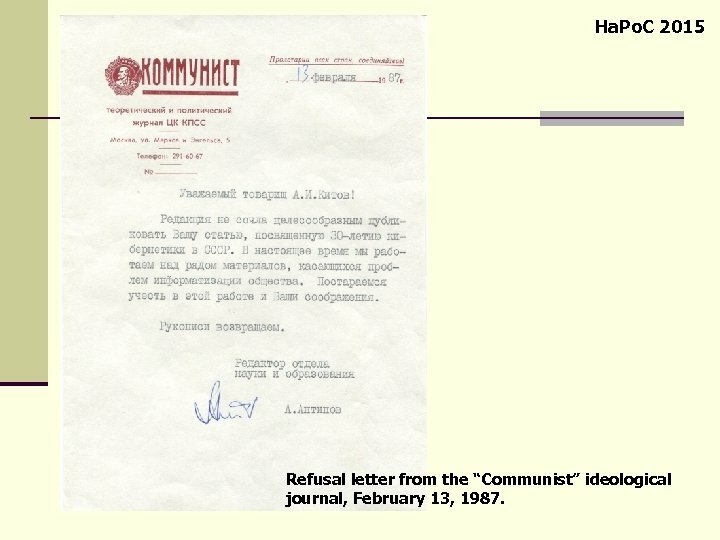 C 2015 Refusal letter from the “Communist” ideological journal, February 13, 1987. Ha. Po. 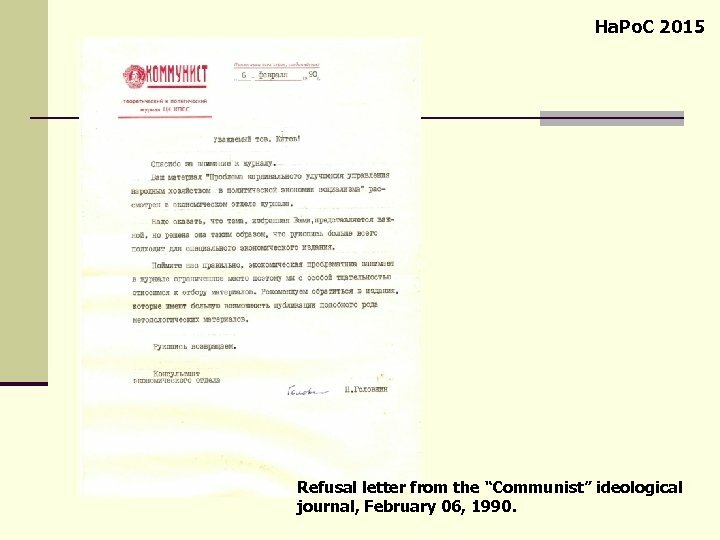 C 2015 Refusal letter from the “Communist” ideological journal, February 06, 1990. Ha. Po. 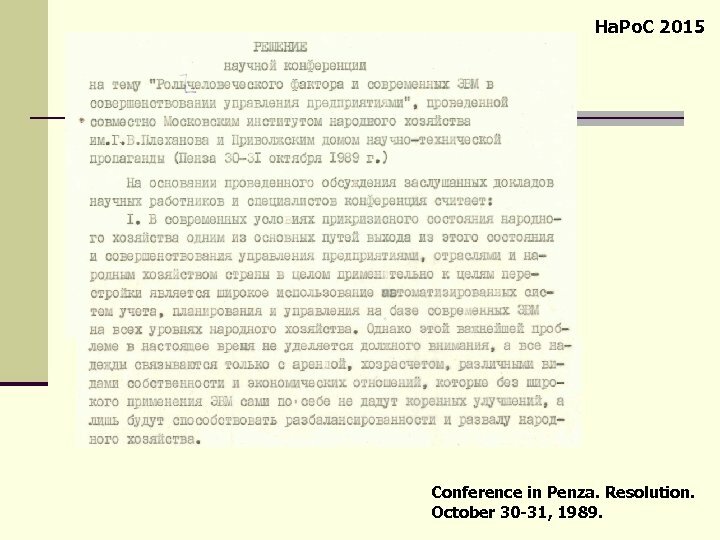 C 2015 Conference in Penza October 30 -31, 1989. Ha. Po. C 2015 Conference in Penza. Resolution. October 30 -31, 1989. Ha. Po. 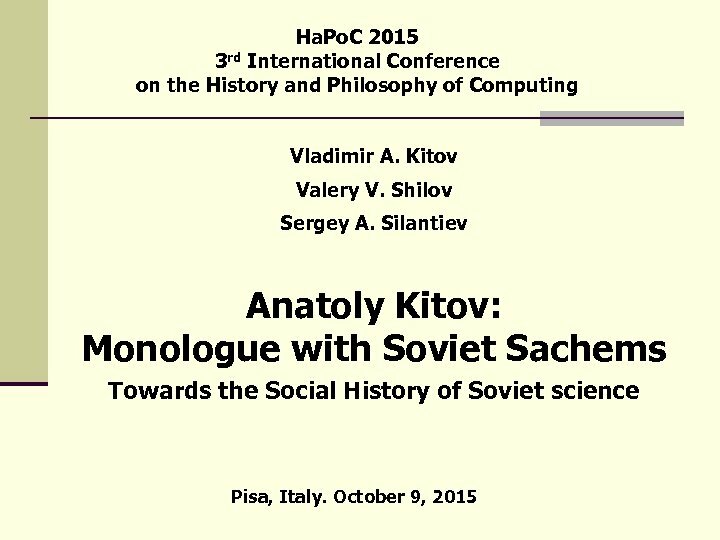 C 2015 So, the dialogue between Anatoly Kitov and Soviet leadership did not take place – remained only the monologue. Scientist’s warnings about the imminent collapse of unviable Soviet economy had come true. 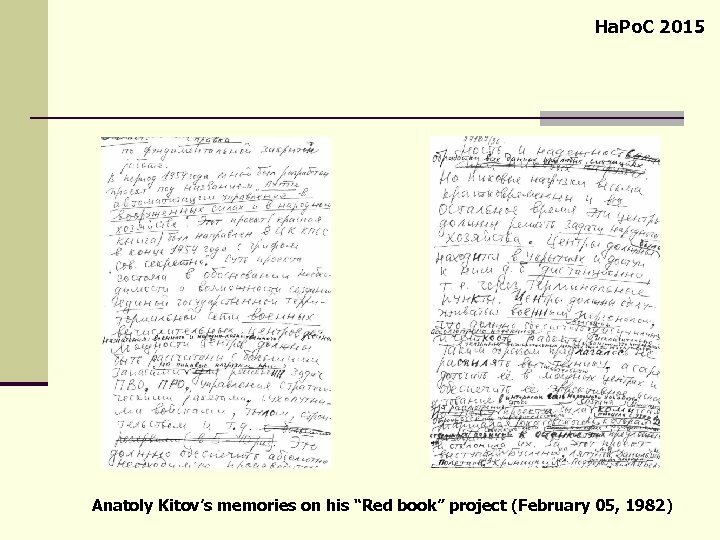 Anatoly Kitov’s biography is full of grand ideas and plans, pioneering publications and dramatic episodes. 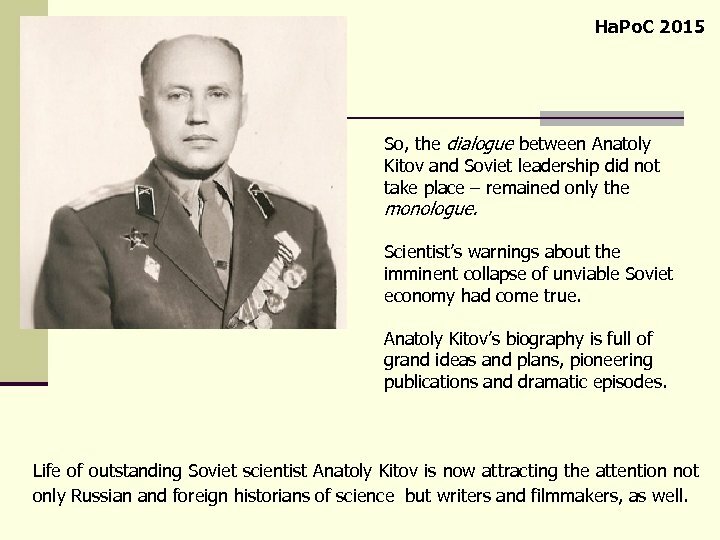 Life of outstanding Soviet scientist Anatoly Kitov is now attracting the attention not only Russian and foreign historians of science but writers and filmmakers, as well. Ha. Po. C 2015 2009. 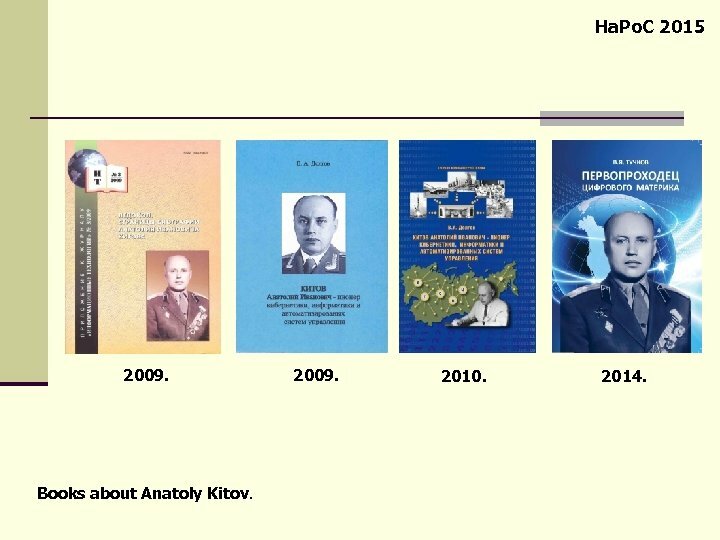 Books about Anatoly Kitov. 2009. 2010. 2014.